Claudia will be speaking at the final #tptalks for 2018. To join us, please register here. Have you and your partners at SPIN had to work over the years to guide your clients to a place where they are more willing to embrace experimental and unconventional typography? 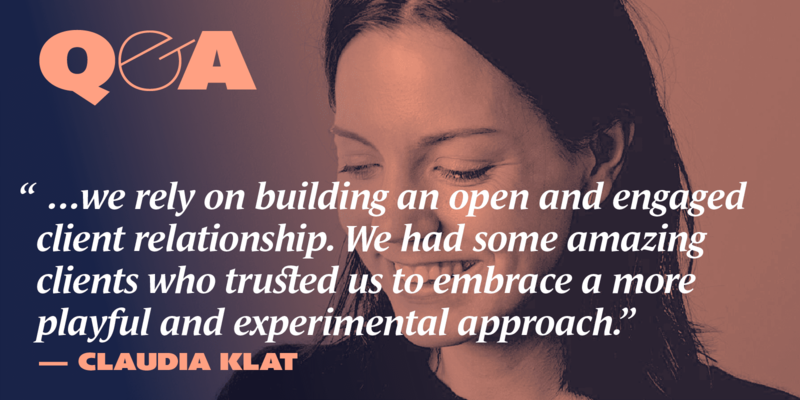 Claudia Klat Usually clients get in touch with us because we have a certain visual approach. Our aim is to come up with a bespoke solution that is in the best case thought provoking, beautiful, memorable and leaves a lasting impression. In order to do that we rely on building an open and engaged client relationship. We had some amazing clients who trusted us to embrace a more playful and experimental approach. In general I think clients are better educated these days in the field of graphic design, which makes it easier to have a creative discussion with them and end up with an interesting result. But I definitely would love to see more experimental and unconventional typography especially in the UK. Our aim is to come up with a bespoke solution that is in the best case thought provoking, beautiful, memorable and leaves a lasting impression. When ever we have time we work on studio projects like for example Spin’s Adventures in Typography which involves a lot of experimentation away from the computer. It’s also an opportunity to push yourself creatively into uncomfortable situations. Also to work with hands definitely shakes certain routines up. Big cup of black coffee. Read emails. Check calendar. Play music. – The Danzig Trilogy. Gunter Grass. – The collected plays of George Bernard Shaw.